There are moments in the life of a student when there is not time nor money to prepare a complex meal, but that doesn’t mean that our food needs to be plain or out of a packet. Food on Friday’s recipe for this week is going to show you, how a few quid can be turned into a lush feast. Is almost the end of term again, soon we will be facing lots of exams and then it will be all over, but not before we enjoy our deserved Easter Break. At this stage, all we can think about is all the parties that lay ahead; all the election celebrations, the Students’ Union Awards 2012, the sports dinners; I could go on, and yet for some reason, my wallet doesn’t seem as excited as I am. To keep the wallet happy and to be able to attend all the parties I am planning to, I will have to make some cuts in my budget. And just in case you find yourself in the same cash strapped situation, I am sharing with you this flavoursome pasta recipe that will cost you less than a fiver. Pasta is one of the most generous foods, it can be cooked almost with anything, and in any way, cold with salads, oven baked or embedded in sauce. It also helps the body to produce a lot of energy and keeps you feeling full for longer. Pasta is very cheap and it makes delicious dishes. The recipe that I will be showing you may seem quite basic but it will fire up your taste buds with its hints of chilli, the aromatic basil and the sweetness of the tomatoes. It is made with a very easy pasta sauce that you can alter and add as many ingredients as you fancy. Mushrooms are a very popular choice but you could go for veggies like courgettes or pumpkin which will add more body to the sauce. 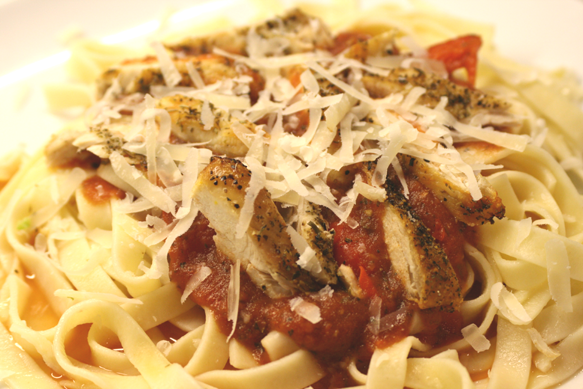 So go on let this chicken pasta show you how sometimes less is more. Season the chicken breasts with the Italian herbs and black pepper, and put them under the grill for 5 minutes on each side. You can always brush a little bit of oil on them to help them to keep moist. After the chicken is cooked slice it and put it to the side. Meanwhile, cook the pasta in a pot with boiling water. Slice the chilli, and half of the red pepper, and chop the garlic. Then add them into a pan with the can of chopped tomatoes, Italian herbs and the basil. Put them on the stove until they boil turn the stove off and leave it to rest for a couple of minutes. Turn the mixture into a thick sauce with the help of a hand blender. Add the salt and paper and taste. If the sauce is too runny put it on the stove for another 5 minutes but keep stirring it otherwise it will stick to the pan. Once the sauce is ready you can then add the rest of the sliced pepper, and it will be ready to be served. 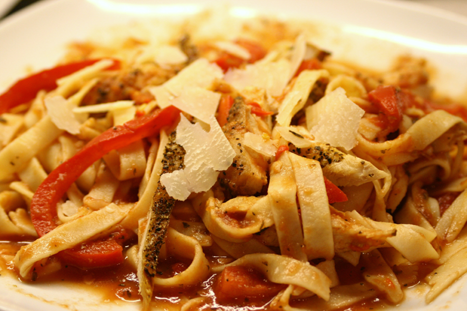 A bed of pasta, a dollop of sauce, slices of juicy chicken and to top it up sprinkles of cheese and black pepper. What more could you need?